This is also a large snake, usually 3.5 to 6 feet long; the longest reported is over 7 feet long. 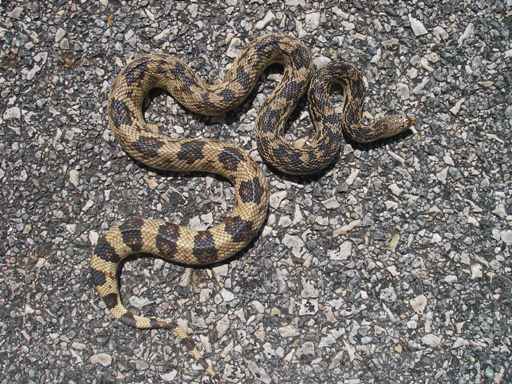 Even when they are first born, they are already 12-18” long – as long as adults of many species that the pine snake lives with. 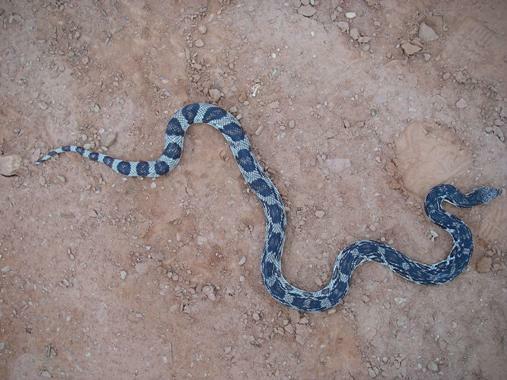 The coloration of the snake is also a good character. They tend to be very boldly patterned with a light background, ranging from yellowish to white, and black markings. Few snakes have such a contrasting obvious color pattern. King snakes can be black and white, but their pattern is much simpler. Pine snakes usually have dark saddles or bands on their back one-third, blending into an almost checkerboard pattern on their middle third, blending into a much heavier dark pattern on their head end. The saddles on their back end are particularly distinctive. Note the color pattern on this black-and-white pine snake. Note the pattern on this more cream-and-black pine snake. Here are the saddles referred to above on a yellowish snake. 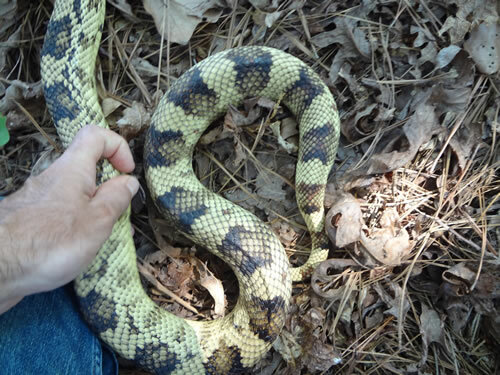 A more technical, but very obvious way to tell a pine snake is to count scales on their head. There is a set of scales that lie directly between the snake’s eyes, another set that lie directly between the snake’s nostrils, and then yet another that are found between these. This last set is called the prefrontal scales. Most similar snakes have two prefrontal scales, but pine snakes have four prefrontal scales. Comparison of prefrontal scales on other species vs. pine snakes.